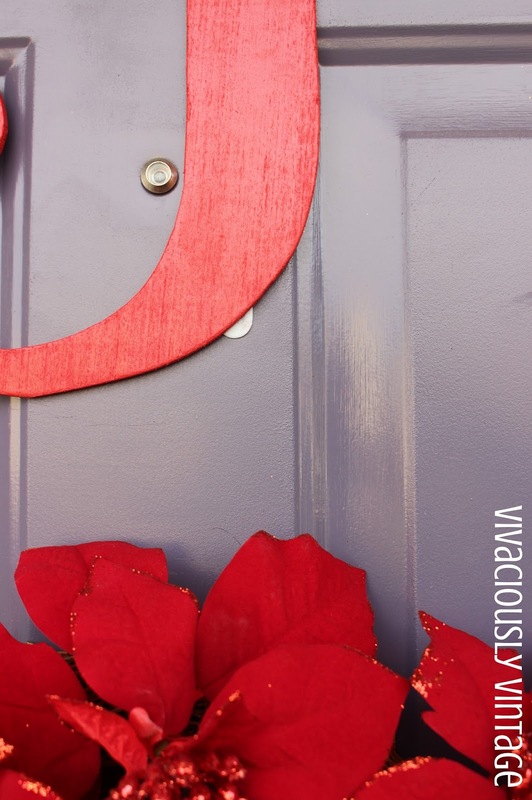 I'm finally sharing this gorgeous DIY door wreath that I made last year. I saw something similar on pinterest, but it was all hanging on a ribbon. I wasn't really sure how to accomplish the ribbon thing...I mean do I nail into the top of my door to have it hang? It just didn't seem like it would work for me. So, I decided to hang each piece individually. I like the floating look mine has! It looks so pretty with my nautical US Navy Christ"mans" tree. ;) I made that last year with things I thought hubby would appreciate. 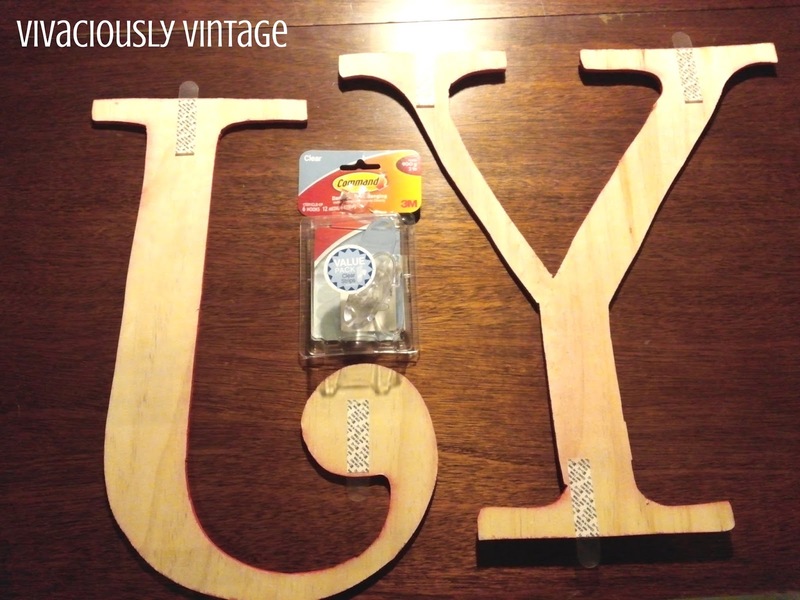 DIY anchor ornaments and Kansas City Chiefs and Royals ornaments. The "o" is the simplest part. 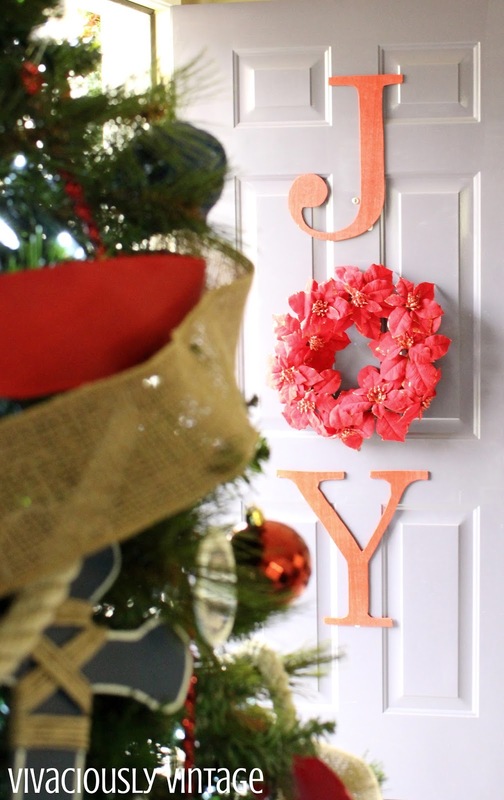 Just find a wreath that is the color and type you like. I recommend a light wreath...the less it weighs the better. But, we'll get to that in a minute. To make the "j" and "y", I used the steps I normally follow when cutting larger items out of wood. Visit this website and upload your image, then follow the directions for enlarging it. So, I just made my letters in Word and saved them as a jpeg image to upload. 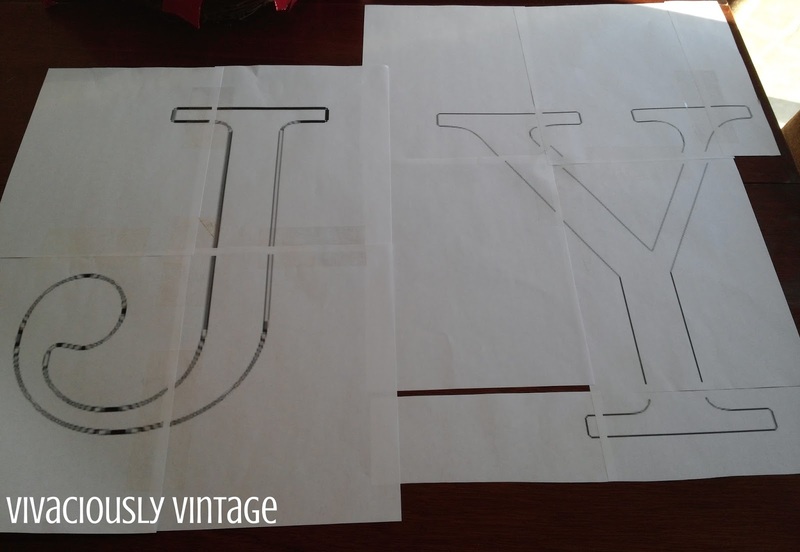 Use the printed templates to cut the letters from 1/4 inch plywood using a jigsaw. Simply spray paint them the color of your choice and done! See how each letter is actually 4 pieces of paper put together? I didn't prime these because I used paint and primer in one. If I was using a very light color, I would have primed first simply for better paint coverage. My front door is under a little roof area, so I didn't find it necessary to apply an exterior protective coat. However, if your weather is more unforgiving or if your pieces will be directly exposed to the elements...this is not something you should skip! As for how I hang them...well this is the reason I didn't blog about it last year! The wreath kept FALLING! I was so upset because I loved this, and it looked so great...when it stayed up! I swear it fell daily. This is why I suggest a lighter wreath. The first one I was using was a cute berry wreath, but it was pretty weighty. 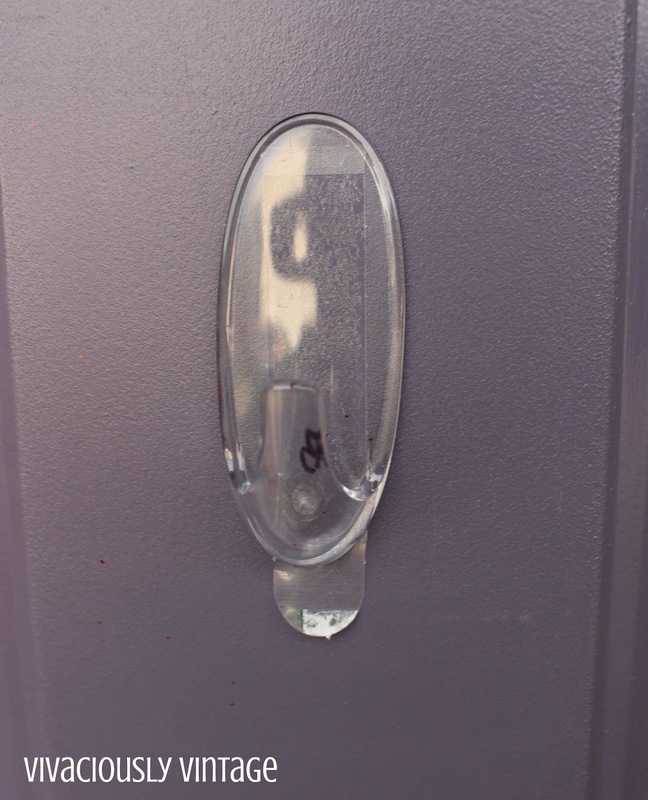 I simply used command strips to hang everything on the door. Follow the directions when applying and leave a bit of the tab peeking out behind the letters so you can remove them easily! 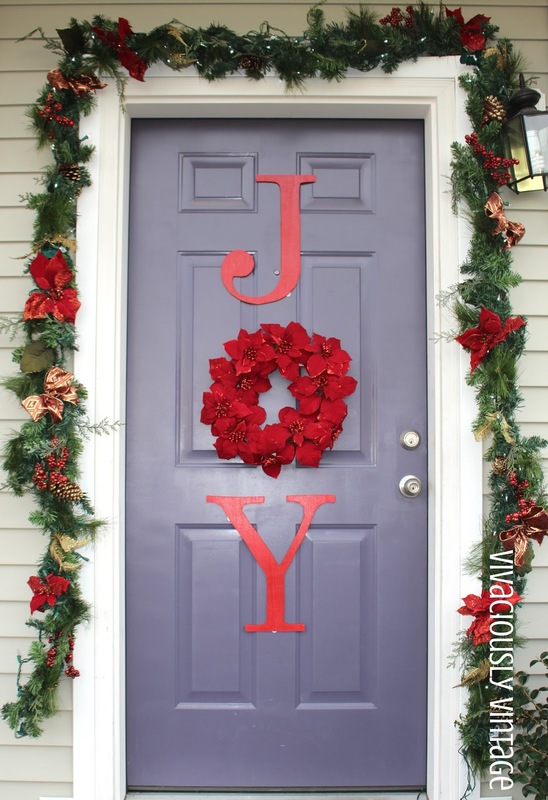 I used 2 medium for each letter and just one large with a hook for the wreath. Be sure that the hook can support the weight of your wreath. I think weight contributed to the falling some, but the type of strips you use is critical. 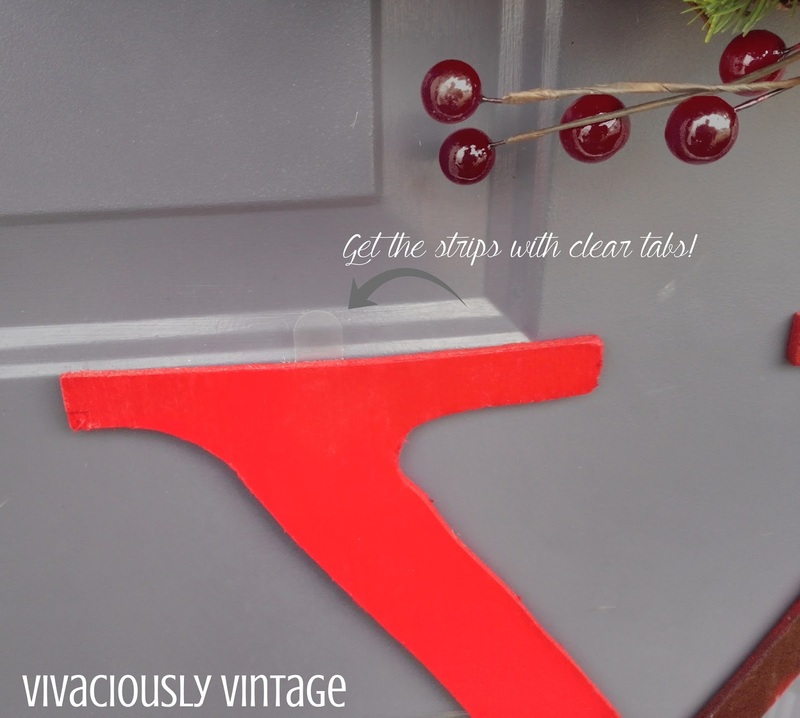 After much heartache using the regular command strips (though I will say they worked for the letters), I noticed that they have OUTDOOR (italic bold underline!!!) command strips. These are made to withstand the more extreme temperatures. Save yourself some tears and get the outdoor ones to hang these up! This year, I used the outdoor ones on the letters just to be safe. Another note on the strips - the outdoor ones have white tabs. I was looking at them thinking that I didn't remember what I did to hide them last year. Then I found the photos I took last year...and the tabs are clear! Apparently, the outdoor tabs don't come in clear. Since I had no issues with the letters falling last year, I think I'll use the normal strips with clear tabs next year. Though, the white tabs aren't really noticeable from far away. 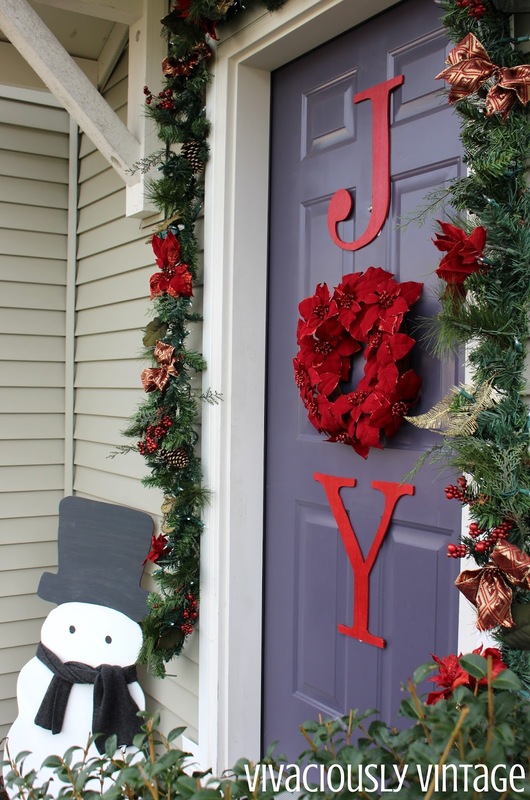 I could always put some purple paint from my front door on them! So far I've had it set up for over a week with temperatures dropping down into the 30s, and nothing has fallen! Sweet Christmas victory!!! I'm so happy they are finally a success! The lighter wreath that I chose works even better than the berry one from last year. It matches the poinsettias that are in my garland! I purchased the garland from Lowe's the first year my husband and I were together. 6 Christmases now and it's going strong! There's another jigsaw project in the background! A cute snowman that I also made last year! Jeremy fussed at me for how long I had the front door open...but the view from my desk was just so pretty!! 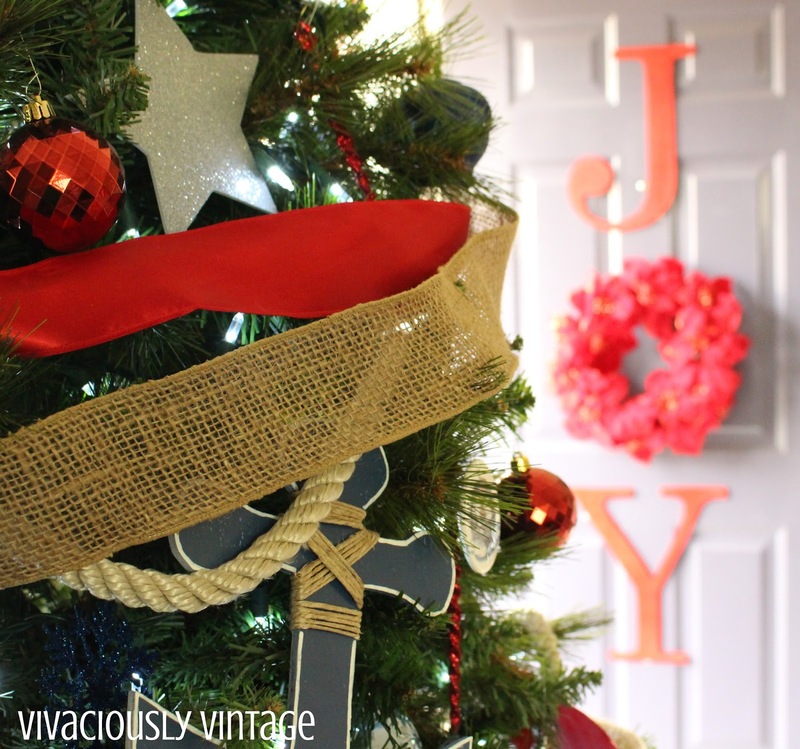 At the end of the day, if you have the right tools (jigsaw and outdoor command strips) this is a very simple DIY joy wreath! 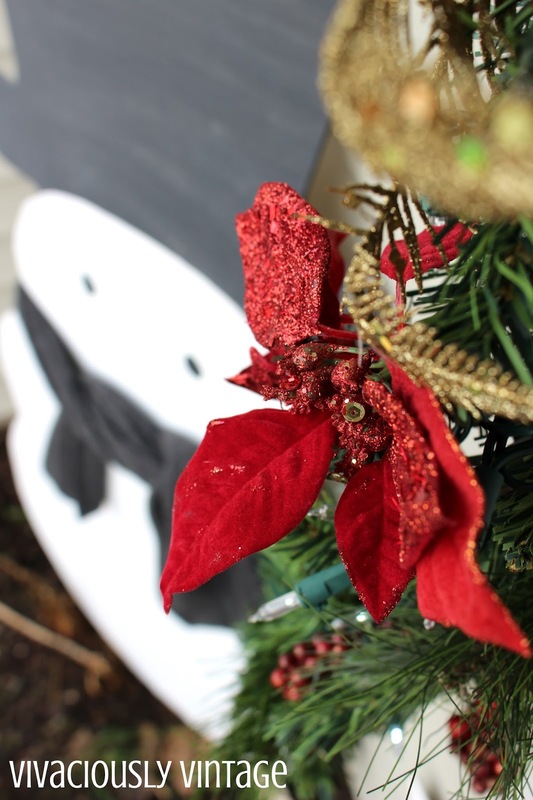 A perfect way to share some holiday cheer in your front yard!